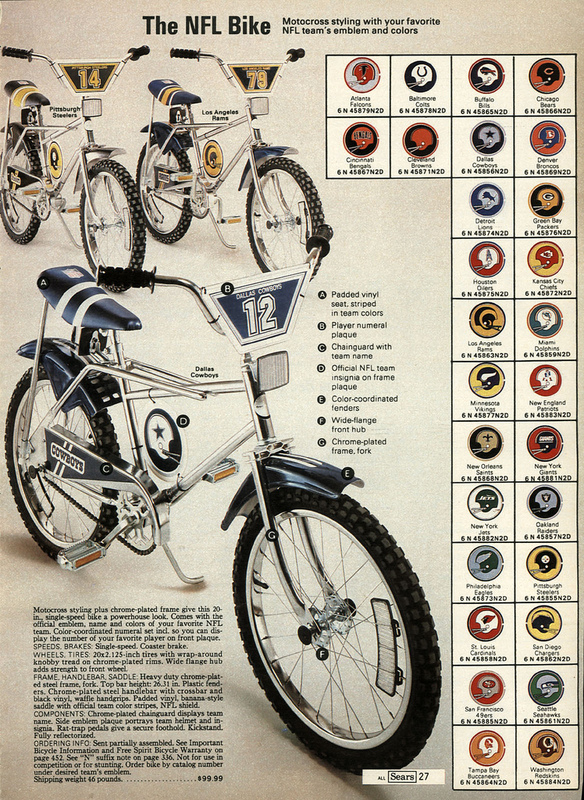 A year later, I decided I like the Steelers better, and was stuck with a Cowboys bike – c’est la vie. I grew up in Las Vegas, so I was pretty fluid in my “favorite team” selection – I switched to the Raiders in 1984 when I was the only kid on my bus who picked them to beat the Redskins in the Super Bowl – I only did it to avoid going with the crowd. 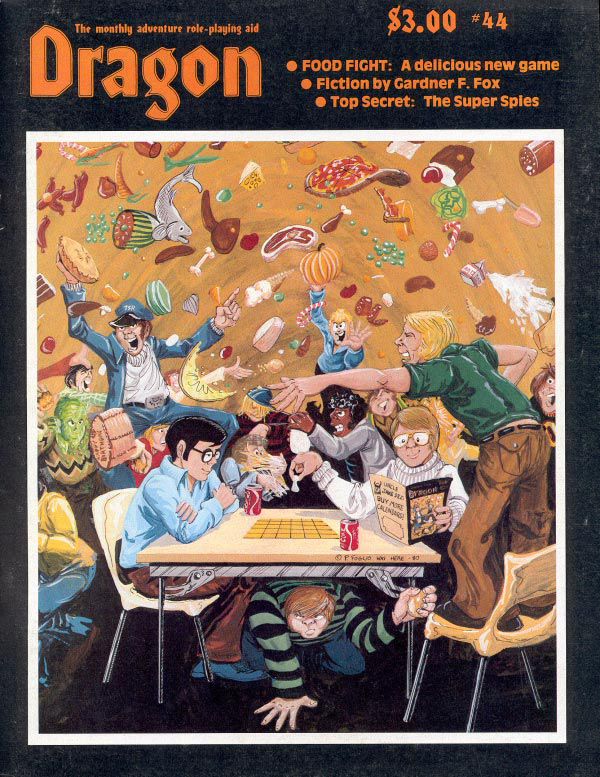 Still, if you were already plays RPG’s in 1980, this issue of Dragon, #44, was what you were perusing over a cup of hot chocolate with some Rankin-Bass on in the background. It looks like a dandy – with a mini-game and everything! 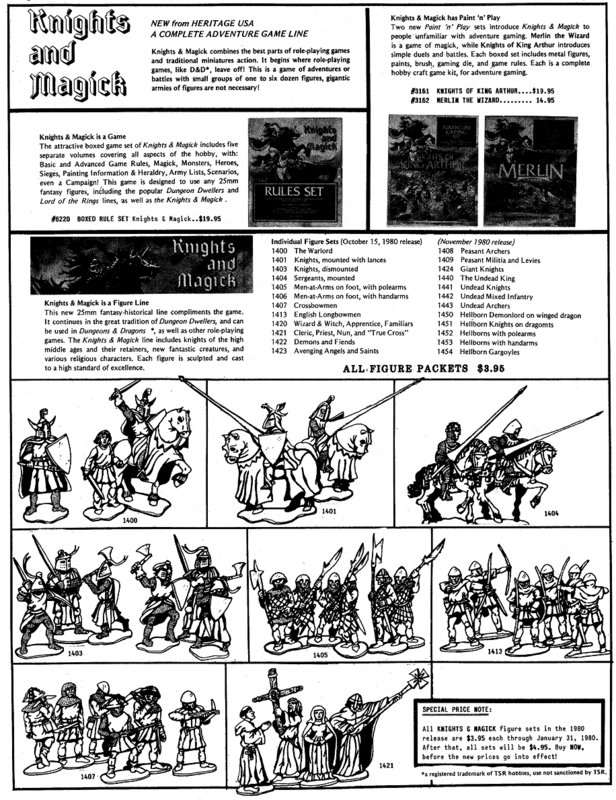 As is often the case, the first thing that caught my eye was the ad by Ral Partha. 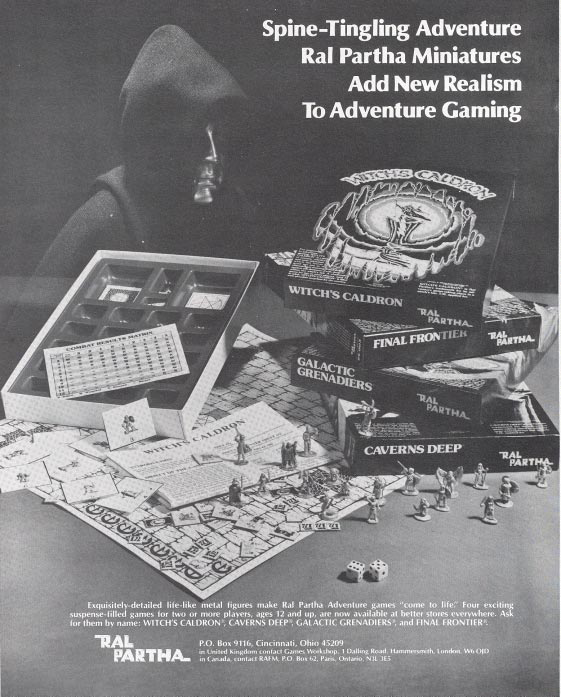 They usually have the first ad in these old Dragon magazines, and this one is for a number of boxed adventure games they did. The games included miniatures, and look pretty cool. I found a site with some pictures of the miniatures. And the mannequin in the hooded robe just gave me an idea for a monster – I’ll post that later in the week. Dig this missive from Mrs. Lori Tartaglio from Mercerville, N.J. She covers bearded female dwarves and Iran hostage crisis all in one letter. Will this endless quibbling never cease? Who CARES if female dwarves have beards or not? (TD#41) Why not let each DM or player or gaming group decide for themselves, for Ghu’s sake?! Answer me this: Will the fact of dwarven women having or NOT having beards affect the outcome of the game in any major capacity? In my humble opinion, the answer is “no.” Not, of course, unless the DM has designed a “beard catcher” as one of his nasty little traps, and a female character of the dwarven persuasion (although no one ever had to persuade me to be a Dwarf-lady!) happens to be one of the party who’d sprung the trap and. . .
OY! This is getting out of hand! Now you’ve got me doing it! 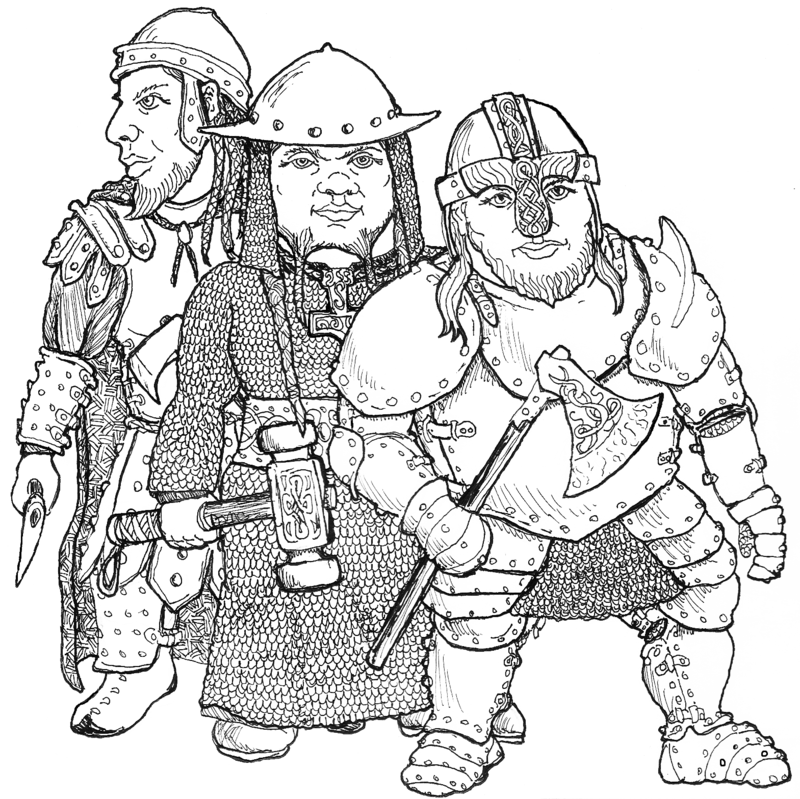 And by the way – I mentioned a few reviews ago that I was going to commission some bearded lady dwarf art, and I did, from Denis McCarthy – this will appear in the second edition of Blood & Treasure. Just as some older issues of Dragon had stats for fictional western heroes for Boot Hill, this issue does the same for some fictional secret agents for Top Secret. The article is written by the developer and editor of the game, Allen Hammack. The weakest stats belong to Maxwell Smart and Napoleon Solo. I don’t want to criticize, but not making Emma Peel the most charming seems crazy … at least from my perspective. The article has full stats for all the agents, which is pretty damn cool. Gregory G. H. Rihn presents one of the articles that could only be from the early days of the hobby – “Fantasy Genetics I – Humanoid Races in Review”. The article gives scientific names for the fantasy races. Elves, for example, are homo sapiens sylvanus, while orcs are homo sapiens orc. Those two races have to be homo sapiens able to breed with good old fashioned homo sapiens sapiens. I guess they should also be able to breed with homo sapiens neanderthalensis. An elf neanderthal crossbreed would give strong math skills, great strength and pointed ears – so Vulcans, essentially. He makes the kobolds, goblins, hobgoblins and bugbears part of the genus Australopithecus and ogres Ramapithecus. This is an interesting idea, and points to a time when the look of the fantasy races was not established – yeah, there was art in the Monster Manual, but it wasn’t treated as carved in stone. This is followed up by “Fantasy Genetics II – Half-Orcs in a Variety of Styles” by Roger Moore. This is a cool little article about the fact that half-orcs are always half-human. So you get some monster stats for orc-kobolds, orc-goblins, orc-ogres, orc-bugbears, orc-hobgoblins and orc-gnolls. Short and sweet, and it would be a nice addition to the half-orc playable race. But we’re not done yet, because John S. Olson gives us “Fantasy Genetics III – What Do You Get When You Cross?”, which is designed to discourage weird crossbreeds. I wonder if the author is this guy from Rice University? Which, of course, brings us to the end of this discussion. There could be absolutely no more to write on the subject of fantasy genetics – the topic has been so thoroughly dealt with that to continue would be folly! So, if the orcs don’t attack first, and you attack without trying to talk to them, you’re evil. I always do a search hoping to stump BoardGameGeek.com – hasn’t happened yet. I know nothing about the game, but the miniature illustrations are cool, and the name “hellborn” is awesome – also Avenging Angels and Saints and Giant Knights. I found the rules for sale for $12.95 by the Gaming Gang and bought a copy – I’ll review them later this month (probably). This issue’s “Giant in the Earth” switches authorship from Tom Moldvay to Dave Cook. Dave writes stats for C.S. Lewis’ Reepicheep (LG 7th level fighter) and Conan Doyle’s Professor Challenger (LN 16th level fighter with special sage abilities). Challenger’s Express hunting rifle is given a 300 yard range and 2d6 damage, in case you’re interested. In 3rd edition, all the monsters got stats. In 1st edition, many of the monsters got stats, here and there, haphazardly. 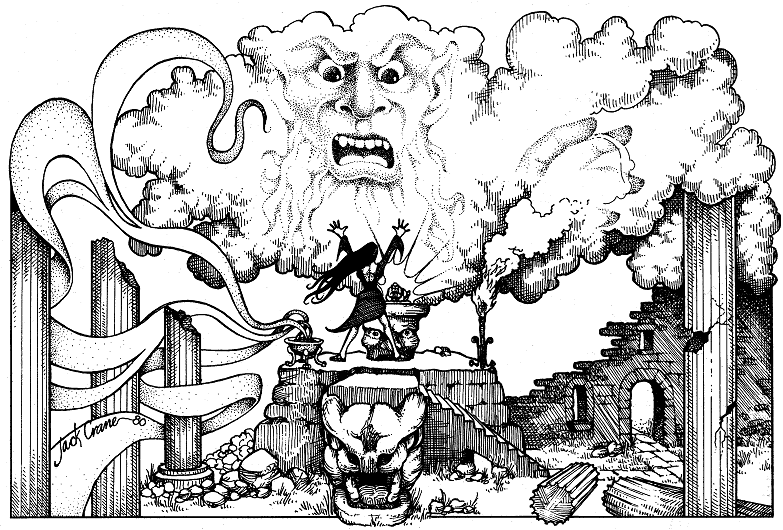 Len Lakofka‘s article this issue, “Monsters: How Strong is Strong” is one of those early efforts to codify these issues, and shows the gradual march of the game from “rulings not rules” to “a rule for everything”. It’s predicated on the fact that a belt of hill giant strength gives a fighter damage that a hill giant doesn’t get, which, of course, cannot be permitted to persist. I guess. For those interested, bugbear chiefs are as strong as ankhegs, but not as strong as gorillas, who are as strong as black bears, but not as strong as carnivorous apes and brown bears. Kobolds roll 4d4 for strength, while leader types have d4+13 strength. He also gives a bit on “how to calculate the combat ability of a monster”. I was going to put in an excerpt, but dang is it long! Ice cream with attack mode D has Range 1, Hit No. 8, App. Damage of 1d6+2, no ability to stun, but the number to splat is 5, slipperiness is 2 and APE is 5. There are different stats for attack mode F and attack mode T.
Oi! I now have a strange desire to make a rules lite version of the game. This issue also has a long article by William Fawcett on the Judge’s Guild (I just noticed a Kickstarter popped up for a JG collection), along with reviews of nine of their products. He also reviews Dungeon of Death and Time Traveller. Koodjanuk, Large (30′ wingspan) Outsider: HD 8, AC 22 [+2], ATK 1 bite (2d6) or 2 talons (4d4), MV 50′ (Fly 110′), SV F8 R6 W8, AL NG, XP 800 (CL 9), Special-Magic resistance 75%, cast cleric spells as 12th level clerics, use psionics, 15% chance found with other good creatures of the upper planes. Cryoserpent, Huge (50′ long) Monster: HD 12, AC 19, ATK 1 bite (4d6), MV 20′, SV F4 R7 W8, AL CE, XP 1200 (CL 13), Special-Magic resistance 25%, immune to cold, vulnerable to fire, gaze paralyzes creatures with 4 HD or less (save negates), tongue freezes water (12,000 square feet, 6″ deep, lasts 12 minutes), hollow tongue can fire 120′ freeze ray (48 damage, save negates), tongue may launch a 4″ diameter ball of ice (120′, +4 to hit, explodes when hits target for 4d6 damage in 10′ radius) – can use these last three powers up to a total of 6 times per day. The bestiary also includes the ice golem by Rich Baldwin. But what about White Dwarf? The Dec 1980/Jan 1981 issue has the usual cool cover, though the color of the lettering could have been a bit better. Black priests must have Wis, Dex and Cha of 13 or higher. They roll d6 for hit points, and they must be evil. If they change alignment, they become thieves. They can wear up to leather armor and use shields when not using thief skills. A black priest’s chance to move silently and hide in shadows is doubled in their own evil temples (neat touch). They are -1 to hit and damage with swords, and +1 to hit and damage with daggers, and -2 to hit with ranged weapons other than throwing knives. Black priests can “backstab” with a strangling cord (1d8 damage, must have Str 7 or higher to use). They rebuke undead and cast spells as evil clerics, and they can call upon the Lords of Evil to summon a monster each battle (lots of rules governing this ability). They gather followers at high levels, including other black priests, displacer beasts, gorgons, hill giants werewolves, minotaurs, invisible stalkers (summon 1/wk), trolls, undead and nightmares. Great class! This issue has an adventure (as most did) – “The Search for the Temple of the Golden Spire” by Barney Sloane. It is intended for seven 2nd-4th level characters. The monster section goes big time, with the Four Horsemen of the Apocalypse by Ian Cooper (one of them, Ky, is a Supra-Lich), Capricorns by Roger Moore, Crystal Golems by Robert Outram, and Ungoliant, Queen of the Spiders by Peter Cockburn. Ungoliant, Huge Outsider: HD 38 (225 hp), AC 26 (Body) 14 (Belly) 24 (Eyes) [+3], ATK Bite (3d12 + swallow whole for instant death on natural 20) and 2 legs (2d12) or 2 palps (1d12), MV 90′, SV F3 R3 W3, AL CE, XP 38,000 (CL41), Special-Magic resistance 80% (50% of which is from her unlight (see below), and can be dispelled), immune to psionics, body oozes contact poison (Poison IV, -3 to save), breath 30′ x 30′ x 30′ fear gas 3/day, 10 eyes function as beholder, except 7th eye fires a matter agitation ray (as the psionic discipline) – one eye fires at a random target every 2 rounds, summon 3d10 phase spiders to cover her retreat. Ungoliant is the originator of all spider kind. She is swathed in unlight (awesome concept – it’s equivalent to 5 darkness spells). She swallows gems, gaining 1 hp per 10 gp value. If she is seriously wounded, she rears up, exposing her belly, and attacks with her bite and 6 legs (2d12). If her unlight is dispelled with five continual light spells, then additional magical light deals 3d10 damage or destroys one of her eyes. A magic whip is embedded in one of her legs. In the hands of a chaotic evil creature it is a +5 flaming whip, +8 vs. good that inflicts 6d6 damage, or 12d6 in the hands of someone with a strength higher than 18. Wow! Lolth is a piker in comparison. So save vs. dragon’s breath involves turning one’s head and holding one’s breath. Interesting concept. That’s it for the White Dwarf, folks – and this post. Have fun!